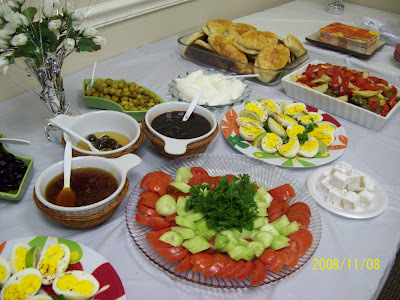 A classical Turkish breakfast consists of feta cheese, butter, green or black olives with 1 tsp olive oil on it, hard or soft boiled eggs garnished with parsley, sliced tomatoes and cucumbers, green peppers, jam/marmalade (a preserve of whole fruits called recel), honey and bread. 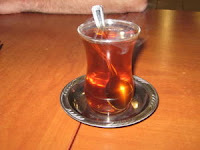 Preserved meat such as sucuk/sujuk (spicy Turkish sausage), pastirma and plain or cheese pastry (pogaca, borek) and even soups can be taken as a morning meal in Turkiye. A common Turkish speciality for breakfast is called menemen, which is prepared with roasted or fresh tomatoes, green peppers, oil and eggs. And black tea is served at breakfast in small tea cups. It is hard to touch it at first, but, you get used to it in couple minutes. 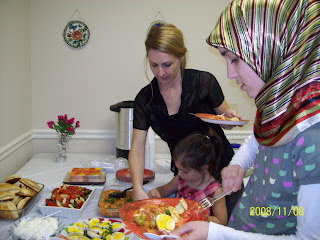 Two weeks ago our club event was traditional Turkish breakfast. 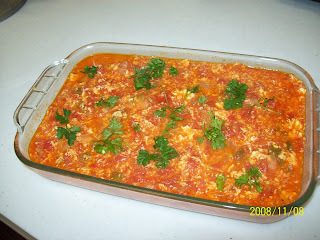 Ozden Abla cooked menemen for us. 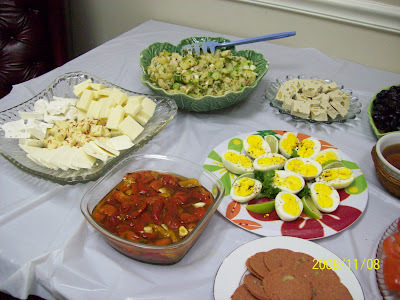 The breakfast table looked wonderful. Saute the onion with butter for 5 min. Add chopped tomatoes and pepper in. Cook it until water avoparate. Break the eggs into a bowl and whisk well. Pour the eggs slowly and mix continously. Put salt in and cook for 3 more minutes. Garnish with parsley. You can add black pepper or chili powder if you like spicy.